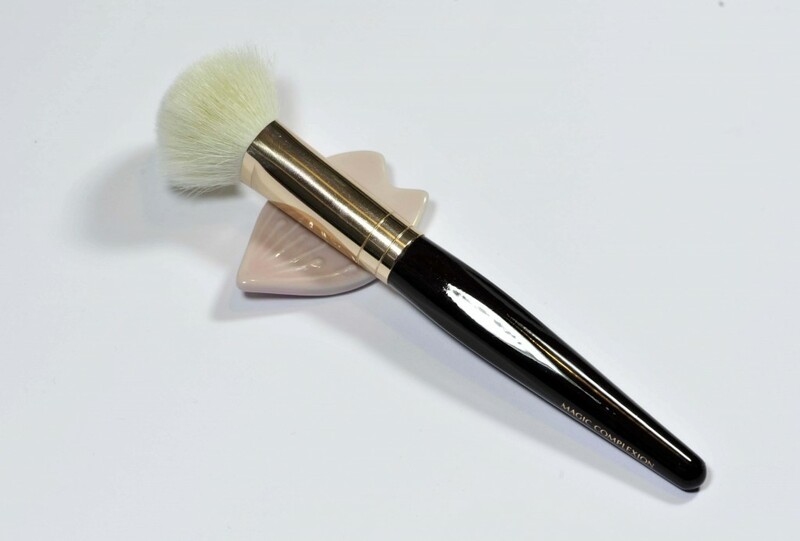 This is the newly released brush from Charlotte Tilbury called Magic Complexion Brush, I got mine at Selfridges, it costs 45GBP, at this price I certainly expected great quality. 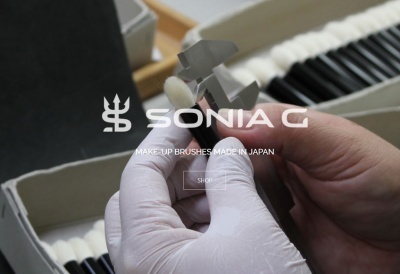 The design of the head was really appealing to me, I love when a foundation brush is not overly dense and with regards to the size and the shape I was really looking forward to it. You don’t get that many details on the website but on the packaging it is writen made in Germany and handmade by european artisans. It feels like goat bristles although I did not find any metion of it, at this moment it’s not yet sold on Charlotte Tilbury’s website. The bristles are quite soft, but if you stipple they may poke, also using the brush the proper way I felt some bristles that were stiff. I have very dry skin and right now even flaky on the nose and it enhanced the flakiness, at this moment I am better off with softer and synthetic brushes but if you don’t have flaky skin like I do, the result is nice, lightweight and airbrushed. I could not reach that well the space between the eyes and the nose, just required a bit of work but I like when a foundation brush is not overly dense like this one. The density is higher in the center and more airy on the sides, it feels a bit strange though, still not sure in a good or in a bad way, I wish it was even less dense in the center. Paying 45GBP for this brush I believe you can expect great quality. Since the moment I washed it, it shed like crazy, during usage it shed so much that after each application (and during) I had to spend a lot of time removing the brisltes plus fluff left behind by the brush. The shedding is not only full sized bristles but also smaller ones, irregular ones, short and fine, like wool fibers, to identify the smaller ones you need a good mirror, I am lucky I have a wonderful one, I could actually post a little review as having a great little magnifying mirror is such a necessary item. 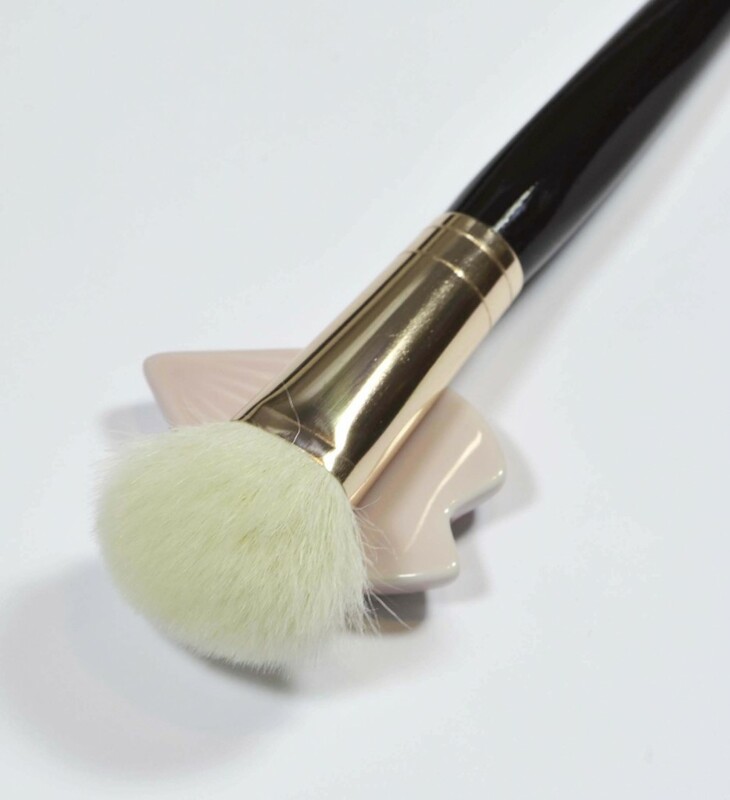 So this brush should just go back to quality control, and even then, I truly think they should do something about the pricing, this is nearly at Tom Ford’s pricing and the quality feels like there is such a gap in between. I have been using the brush the whole week, washing it over and over to check if it would stop shedding and see how it would evolve, unfortunately, it’s 45GBP too much. I am not even going to compare it to other brushes because at this stage I think the brush has issues that should be fixed before trying to compare it to other foundation brushes. The idea behind the design was good but the result is not acceptable. From her range I have the smudger and blender eyebrushes which are very nice, efficient and absolutely soft enough, the blush however is too rough for my skin but I do like the shape and I am quite sad I can’t use it. If you have this brush, it would be fantastic if you can share your thoughts, maybe it’s just my brush that has issues? CHARLOTTE TILBURY Magic Complexion Brush was last modified: December 20th, 2015 by Sonia G.
Do you love her other brushes ? I just googled the Kevyn, the shape looks nice, and “extra soft goat hair” makes me curious, however I never took the plunge on his brushes after seeing them in person I was not that tempted, do you already own some of them? I think that brush is a dud, all the brushes I own from her never shed like that at all. I don’t love her brushes, but I do find them functional. My two favorites are the Eye Blender Brush and the Eye Smudger Brush. I found the hair to be actually very soft, so I was quite pleased with those 2. I own 3 KA brushes. The Concealer Brush because Lisa Eldridge featured it in her fav videos years ago. Its actually a little gem. The other brush I have is the Small Eyeshadow & Eyebrow Brush. Its pony hair. In fact, when I saw the Shaquda 824 Smokey Eye Brush, it reminded me of my KA. Its soft enough for me, but I don’t have an extreme sensitivity on my skin yet. And then I also purchased his Eyeliner Smudger Brush. 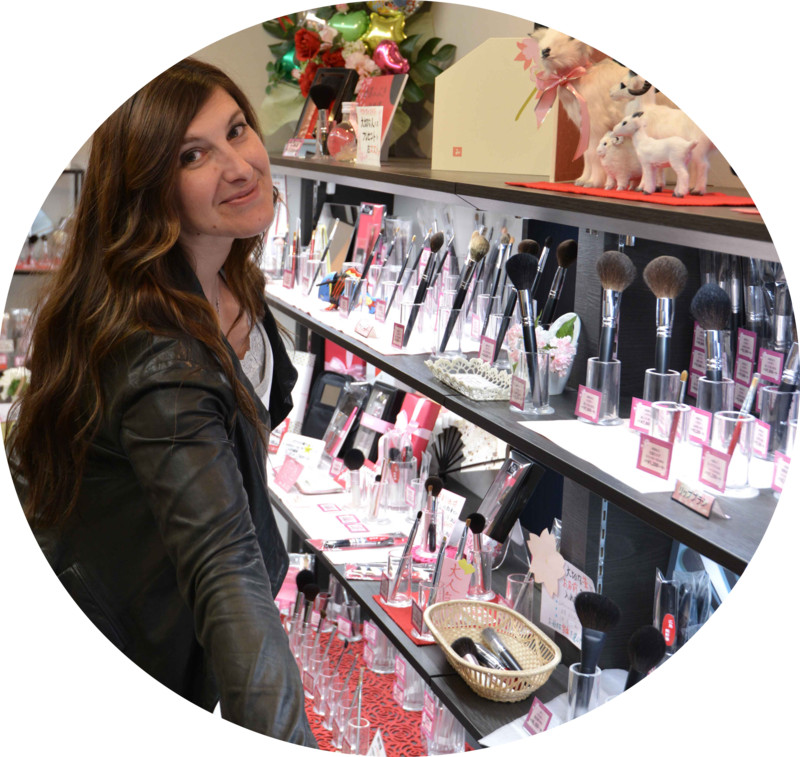 Mainly to carry it in my purse to create quick day to evening looks on the go. But his new Loose Powder Brush is tempting. I was wondering about the softness of the hair. His brushes are made in China though for those who are wondering. I kind of like the resin handles, they are different. But I’ve never wanted to purchase more. What a shame!!! I love the shape of the brush. I would contact them on sending it back. I’m sure that Charlotte herself would be horrified to have something like this going out to her customers, especially since her brand is built on luxury and decadence. Agree with you totally 100% about Charlotte Tilbury brushes. I bought this brush, and now really regret it. I didn’t like her other brushes so I was stupid to buy this one, a total waste of money. The handle design is the only thing I like. I did a YouTube video review a couple of years ago on the brushes and said exactly the same thing then – I clearly have a very short memory! The price is so out of sync with the quality. 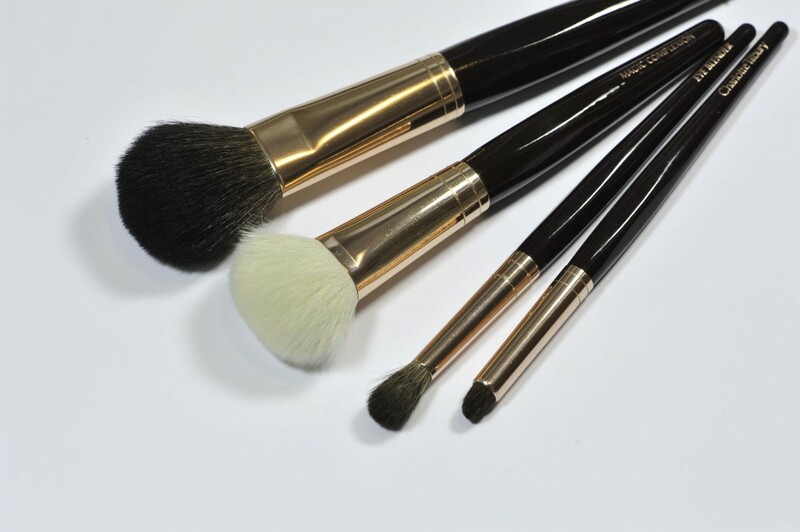 For normal department store brands Bobbi Brown and Tom Ford brushes are so much better for a similar price. And of course, for the same price a Hakuhodo or Chikuhodo GSN series would blow these out of the water. Some luxury beauty brands have brushes that are well overpriced for their quality, although I enjoy the smudger and the blender a lot but still the price of her brushes is so out of sync.. I purchased this brush as well and mine did the same. It she’d like crazy and I spent more time picking the white hairs off my face than it took to apply the foundation. I will be returning this brush based on quality. My pleasure Monica, I am sad this is such a fail, I should have returned mine too!